This keyboard probably seems a bit out of place on this non-gaming system. I wanted a quality back-lit keyboard that would be good for typing. 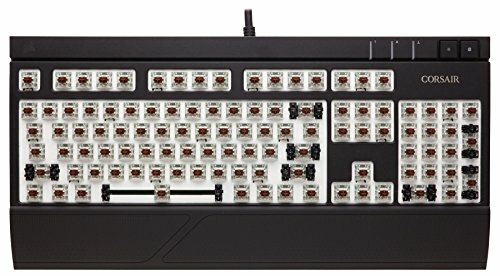 I wanted a keyboard with Cherry MX switches which are known for their quality and after researching the differences between red, brown and blue I figured that the brown switches is probably what I wanted. Red is for gamers, blue is for typing but are considered too noisy so brown is the compromise. Then I see that Cherry has a new switch named the MX Silent. Turns out that is a switch that has the feel of the Cherry MX Red but are much less noisy then the Red. 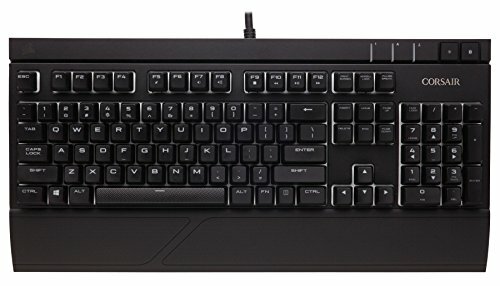 So I purchased two keyboards, one MX Silent and one MX Brown so that I can evaluate them for myself. The MX Red and thus MX silent don't have tactile feedback like the MX Brown and Blues. I have always been a fan of tactile feedback so I am leaning toward keeping the MX Brown version even if it is a bit noisier. As far as the backlight originally I was not thinking RGB but I don't think I would like to look at red all the time so I decided to get the RGB so I can mix it up a bit. You need to run corsairs keyboard software to change the colors. When the system boots the LEDs are in their default colors until that software loads which is a bit annoying. Can't the keyboard remember what colors it last used? There is a button so you can easily change the light intensity to low, medium or high. I love this keyboard so much along with other Corsair products. It is well made and has many programming options. It looks awesome and feels great. Really nice keyboard. Had to return one because of a broken brightness button but has great lighting and switches are great as usual. 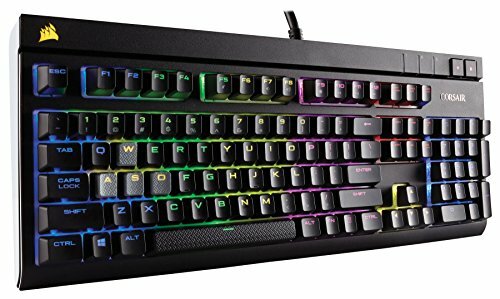 Really cool keyboard and the keys are great for every game I play! My ESC button keeps falling off and I think it's insane that it doesn't have dedicated hardware buttons for volume control. Still, I prefer it over Razer. Mechanical + Cherry MX Red = Great! I love the CUE sync across all RBG Corsair Devices. My first mechanical keyboard and an amazing upgrade from a membrane keyboard both for typing and gaming. Once acclimated to using it, my typing speed & accuracy were higher than ever; the keys have a very nice tactile feel and gentle touch to them with a satisfying "click" when depressed, unlike membrane keyboards which feel flat and sticky by comparison. Gaming is also very fluid & precise. 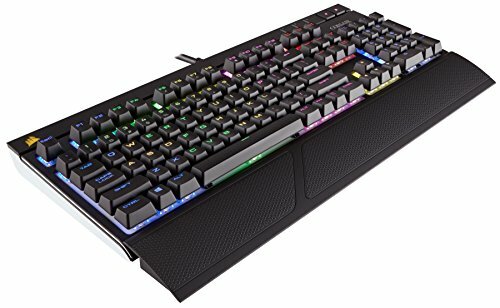 Apart from dedicated media keys, this is a full-featured keyboard with individual RGB lighting on each key, a variety of lighting settings (controlled with Corsair Utility Engine), and an on-board USB port. It comes with sets of textured WASD and QWERDF keys for gamers and a very comfortable removable, rubber-gripped wrist rest. The response and fell are great and the lighting is amazing.